The European IPO market is recovering from 2012, but is not nearly as robust as it was before the eurozone crisis hit. The European market for new listings is staging an impressive comeback, with initial public offerings raising more cash so far this year than in all of 2012. According to data from Dealogic, new listings on European stock exchanges this year have raised $16.2 billion, nearly triple the amount raised in the same period last year. The revival comes as concerns about the break-up of the eurozone have all but disappeared and equity markets have rallied. U.S. investors are slowly rebuilding their exposure to Europe, after previously fleeing the region when the sovereign debt crisis was raging. And company profits are rising as Europe emerges from recession. "There's a fundamental earnings recovery story in Europe that U.S. investors find quite compelling," said Gareth McCartney, a London-based managing director at UBS (UBS). McCartney points out that the IPO market in the U.K. has been particularly strong, held up by issuers in the property and insurance markets. Related: The American IPO market is on fire! 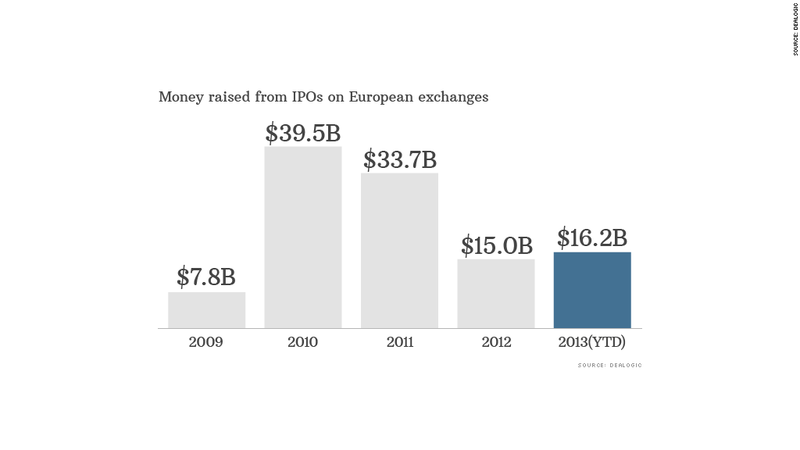 But it's not time to pop the champagne quite yet -- European IPO activity still hasn't hit the levels seen in 2010 and 2011 when over $30 billion was raised each year. Looking ahead to the rest of the year and into 2014, the European IPO market is expected to maintain its upward momentum, even if the volumes from a couple of years ago remain out of reach. "The pipeline of potential IPOs remains very healthy and continues to grow. We'll see a continued recovery of the European market into 2014," said McCartney. Leon Saunders Calvert, head of banking and research at Thomson Reuters, said Europe is the only region expected to see an increase in offerings over the next few months as activity in U.S. and Asian markets slows. "There will be continued slow growth in the European IPO market. But that growth comes off a ridiculously bare market in 2012," said Saunders Calvert. Among the high profile listings expected for the rest of the year, Britain's Royal Mail is set to be privatized in a deal expected to value the company at roughly £3 billion ($5 billion). Earlier this year, real estate firm LEG Immobilien raised roughly $1.6 billion when it listed in Frankfurt. This was one of the largest IPOs in the world this year. There have been 578 IPOs around the world so far this year, raising nearly $100 billion, according to Dealogic. The New York Stock Exchange has grabbed the biggest share, according to Thomson Reuters data. It played host to 69 IPOs, representing 27% of all cash raised. The tech-heavy Nasdaq came in second place, with the same number of listings but a smaller amount of money raised.